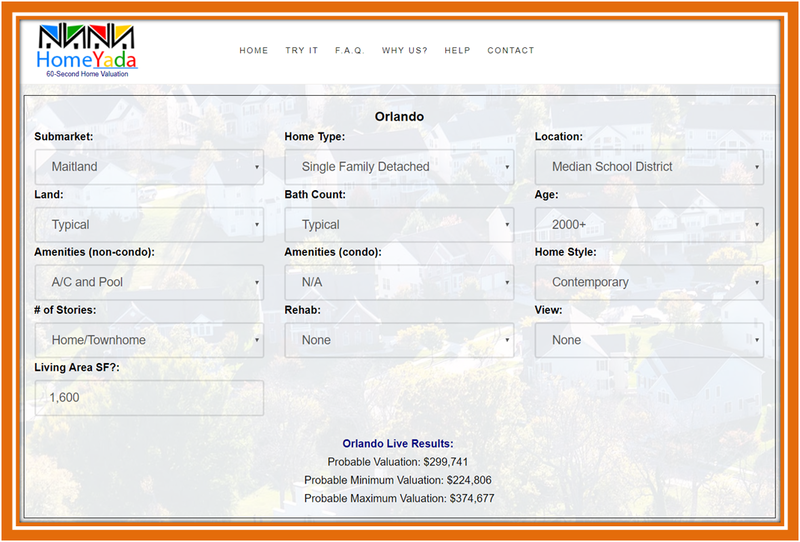 Silicon Valley Single Family Housing Market vs. the Condo Market – Who Wins? The Silicon Valley (Santa Clara County) Single Family Housing market continues to trend up, breaking out of the extended congestion zone of $1.1M to $1.2M. In terms of growth, even on a smooth basis, market moved up from $1.0M to $1.2M, an astounding 20% growth in a year. Importantly, all three recent breakouts produced higher highs. Both trendlines are amply confirming the breach of congestion. The Silicon Valley Condo market trends up on a linear path. The trend is definitely linear, but not a perfect one as evident by the low r-squared. The 2-Mo Moving Average is also confirming the linear trend. While the big drop in Dec-17 (#12) is being ignored by both trendlines, they are however pointing to a breakout eclipsing the prior high of $850K. Even on a smooth basis, the market moved up from $700K to $850K, a whopping 21% growth in a year. Both markets are demonstrating very similar growth patterns and results, proving that the contest is a close tie. Alternatively, they both are standout winners considering the overall strength of the respective market. 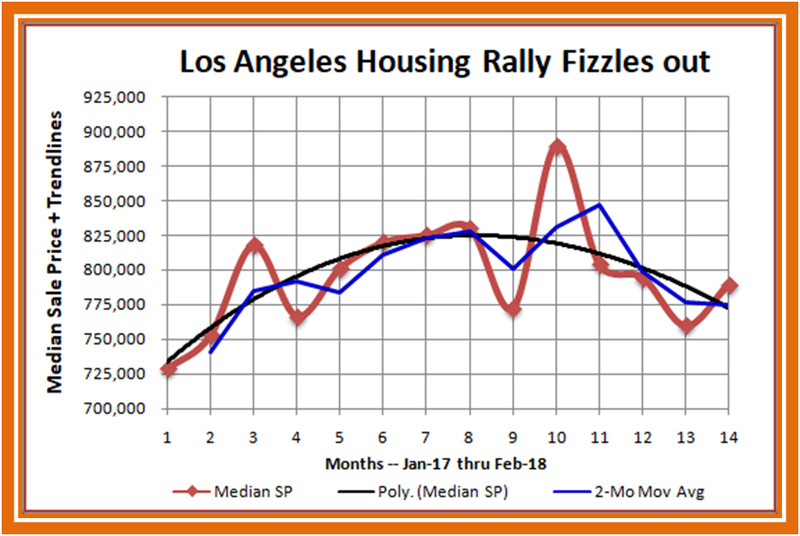 Los Angeles Single Family Housing Market vs. the Condo Market – Who Wins? 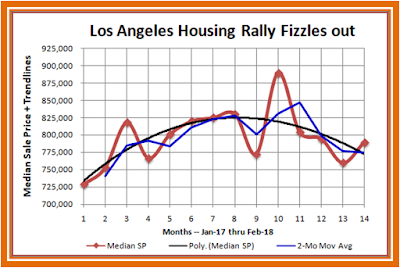 Though the Los Angeles Single Family Residential ("Housing") market shot up from $725K to $850K in a year, it quickly trended down to $775K, giving back half of the nominal gains and remaining somewhat directionless. Since both trendlines are confirming the declining trend, this market needs a rapid trend reversal. The fact that the housing market has already breached the $775K soft support would make prospective buyers quite nervous. 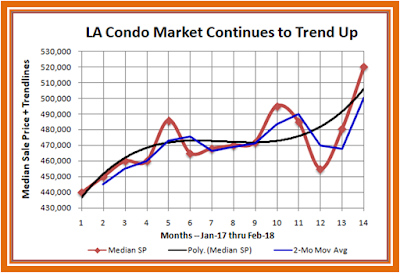 The LA Condo market, on the other hand, shows significant strength, rising from $440K to $500K during the same period. On its way up, it had three breakouts, each one eclipsing the prior high, thus pointing to strengthening fundamentals. Both trendlines are rejecting the Dec-17 dip as an aberration. 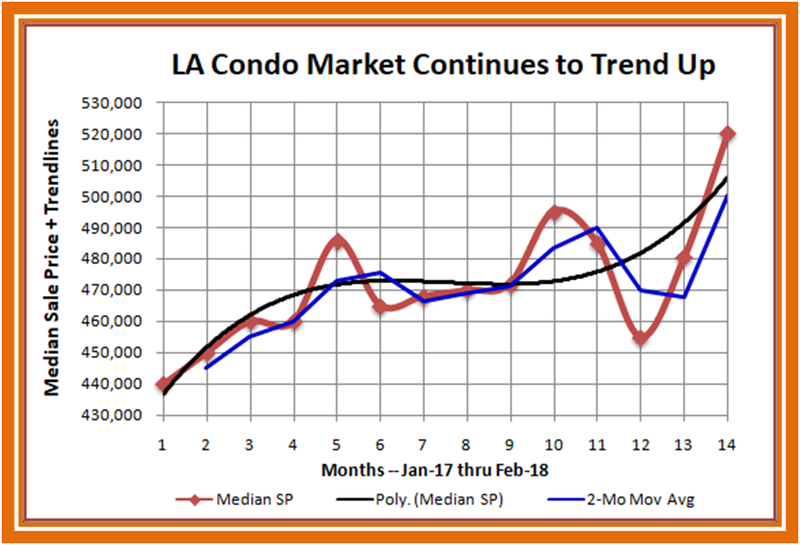 Given the steadily improving market trend backed by strong fundamentals, the standout winner is the Condo market. 1. Just because you are starting out, do not underestimate yourself. The very fact that you have been tasked with this critical presentation speaks volumes, so take full advantage of this visibility in narrowing the competition down. These meetings are often frequented by other department heads and high-level client representatives, leading to significant loss of time in unrelated (business) discussions. The best way to prepare for such contingencies is to split the presentation up into a two-phase solution where phase-1 leads seamlessly to phase-2. 2. In a business environment, it's never a good idea to start with a complicated stat/econ model. Start a bit slow but use your analytical acumen and presentation skill to gradually force people to converge on the same page, thus retaining maximum control over the presentation (time and theme). Therefore, the phase-1 solution should be the same as the full* 30-min solution we detailed before (*including the sub-market analysis). Even if the meeting leads to unrelated business chit-chat, off and on, you will still be able to squeeze in the phase-1 solution, thus offering at least a baseline solution. Alternatively, if you have one all-encompassing solution, you will end up offering virtually nothing. 3. Now that you have finished presenting the phase-1, establishing a meaningful baseline, you are ready to transition to the higher-up phase-2 solution. In other words, it's time to show off your modeling knowledge. In phase-1 you presented a baseline Champ-Challenger analysis (Champ=Median Sale Price, MoM; Challenger=Median SP/SF, MoM). You used the "Median" to avoid having to clean up the dataset for major outliers. Here is the caveat though: Sales, individually, are mostly judgment calls; for example, someone bent on buying a pink house would overpay; an investor would underpay by luring a seller with a cash offer, etc. In the middle (middle 68% of the bell curve), the so-called informed buyers would use five comps, usually hand-picked by the salespeople, to value their subjects - not an exact science either. 4. Now, let's envision where you would be at this stage - 30 minutes on hand and brimming with confidence. But it's not enough time to try to develop and present a true multi-stage, multi-cycle AVM (see my recent post on 'How to Build A Better AVM'). So, settle for a straight-forward Regression-based modeling solution, allowing time for a few new slides to the original presentation. Build the model as one log equation with limited number of variables (though covering all of the three major categories). Variables you might like to choose: Living Area, Age, Bldg Style, Grade, Condition and School/Assessing District. Avoid 2nd tier variables (e.g., Garage SF, View, Site Elevation, etc.). 5. Derive the time adjustment factors from phase-1 (it's a MoM) and create Time Adjusted Sale Price (ASP), the dependent variable in your Regression model. Explain this connection in your presentation so the audience (including your SVP/EVP boss) knows the two phases are not mutually exclusive, rather one is the stepping stone to the other. At this point, you could face this question "Why did you split it up into two?" Keep you answer short and truthful: "It's a time-based contingency plan." 6. Keep the Regression output handy but do not insert it into the main presentation as it is a log model (audience may not be able to relate to the log parameter estimates). If the issue comes up, talk about the three important aspects of the model: a) variable selection (how you managed to represent all three categories), b) most important variables as judged by the model (walk down on the t-stat and p-value) and c) overall accuracy of the model (r-squared, f-statistics, confidence, etc.). 7. Present model results in two simple steps. Value Step: ASP vs. Regression values. Show the entire percentile curve - 1st to 99th. Point out the smoothness of the Regression values vis-a-vis ASP. Even arms-length sales tend to be somewhat irrational on both ends of the curve (<=5th and >=95th). Standard deviation of the Regression values would be much lower than ASP's. Ratio Step: Run stats on the Regression Ratio (Regression Value to ASP). It's easier to explain the Regression Ratios than the natural numbers so spend more time on the ratios. 8. Time permitting, run the above stats both ways - with and without outliers. Define outliers by the Regression Ratios. Keep it simple; example: remove all ratios below the 5th and above the 95th percentile or below 70 and above 143, etc. Considering this is the outlier-free output, run Std Dev, COV, COD etc. These stats would be significantly better than the prior (with outliers) ones. Another common outlier question is: "Why no waterfront in your model?" The answer is simple: Generally, waterfront parcels comprise less than 5% of the population, hence difficult to test representativeness. FYI - in an actual AVM, if sold waterfront parcels properly represent the waterfront population, it could be tried in the model, as long as it clears the multi-collinearity test. 9. Last but least, be prepared to face an obvious question: "What is the point of developing this model?" 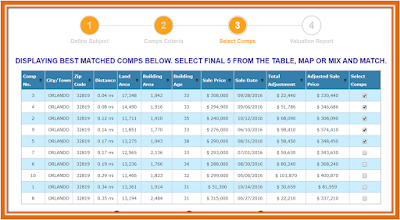 Here is the answer: A sale price is more than a handful of top-line comps. It comprises an array of important variables like size, age, land and building characteristics, fixed and micro locations, etc. 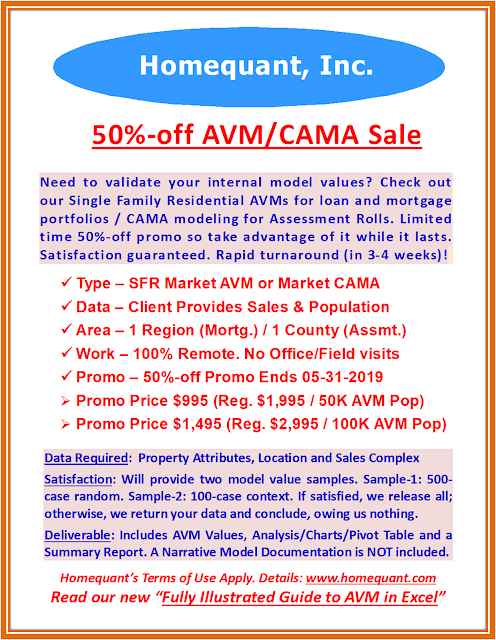 so only a multivariate model can do justice to sale price by properly capturing and representing all of these variables. The output from this Regression model is the statistically significant market replica of the sales population. Moreover, this model can be applied on to the unsold population to generate very meaningful market values. Simply put, this Regression model is an econometric market solution. Granted, the unsold population could be comp'd but that's a very time-consuming and subjective process. Ace the next presentation. Be a hero. Prove to your bosses you are a future CEO. Also, do not confuse Scoring with Ranking. The Silicon Valley Condo Market continues to trend up on a linear path. The trend is definitely linear, but not a perfect one as evidenced by the low r-squared. The 2-Mo Moving Average is also confirming the linear trend. While the big drop in December is ignored by both trendlines, they are however pointing to a breakout eclipsing the prior high of $850K. Even on a smooth basis, the market moved up from $700K to $850K, a whopping 21% growth in a year. The normalized trend (bottom chart) is even more vigorous, moving up from $500/SF to $675/SF, an astounding 35% annual growth. Again, both trendlines are rejecting the trough and the peak at the long end of the curve. Nonetheless, the growth has been spectacular. Without the outliers (Dec-17 and Feb-18), the r-squared jumps to 0.907 with the slope steepening to a near-perfect linear trend (not shown). 1. 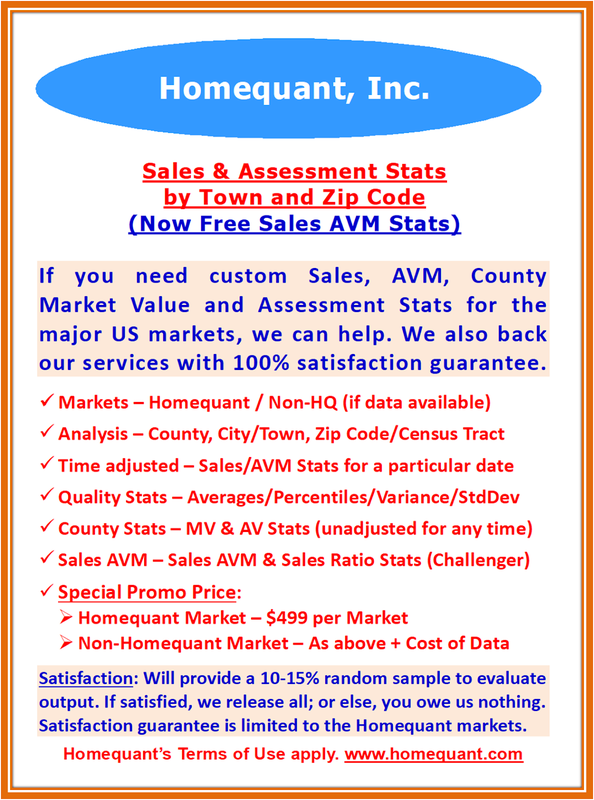 Sales Sample: Assuming you are developing an “Application” AVM (meaning you are going to apply the AVM on to the population the sample is derived from), make sure you are working with a representative sales sample. While testing the sampling properties, consider all three categories of variables: Continuous (Bldg SF, Lot SF, Age, etc. ), Categorical (Bldg Style, Exterior Wall, Grade, Condition, etc.) and Fixed Location (Town, School District, Assessing District, etc.). You need a representative sample, failing which the model would be inaccurate. 2. Time Adjustment: Depending on the sales liquidity, a market AVM requires 12 to 24 months worth of arms-length sales. When the time series is extended (18+ months), quarterly adjustments are more effective as they are smoother and more market-efficient (reduces inconsistencies arising from using the “closing” dates rather than the contract dates). Time is a surface correction so keep it at the “outer” level; for instance, if you are modeling a county, keep time adjustments at the county level, without drilling down to the sub-markets. 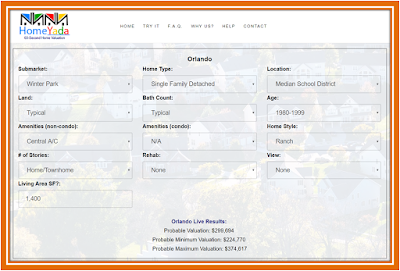 Also, avoid price-related (FHA, Jumbo, etc.) corrections. · 3. Hold-out Sample: Once the sales are time adjusted, split up the sales sample between modeling sample (80%) and hold-out sample (20%). Both sub-samples must have very similar attributes as the original sales sample representing the population. To reduce judgment, use software-provided sampling procedures. Develop the model using the modeling sample and then test it on to the hold-out. While the results will not be exact, they must be similar (very close). · 4. Multi-stage Regression: Since you have to model three different types of variables, develop a three-stage regression model, piggy-backing the output from the prior stage. The contributions are generally non-linear so the log-linear model is more effective. If you have a comprehensive dataset with many categorical variables, run a correlation matrix to determine multi-collinearity (if certain variables are highly correlated) leading to reduced number of variables. If you have limited number of variables, use the t-stat to control the significance. If a variable’s t-stat is less than 2, it is generally non-contributing. · 5. Multi-cycle Regression: In order to make the model efficient, develop it in three cycles. Use the first cycle to define and remove outliers. Create Sales Ratios (AVM values to Adjusted Sale Prices) to define/remove outliers. Then, use the outlier-free sample to run the cycle two to generate pre-residual values. Upon residual correction, run the third and final cycle to produce the model and values. If you develop the model systematically and methodically, it will be far more efficient. · 6. Residual Analysis: At the end of the second cycle work on your residuals. 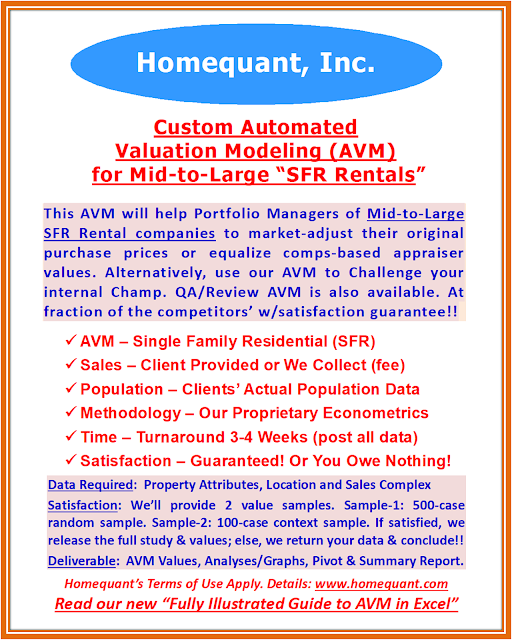 The fact that some Sales Ratios are clustered around 70 or 143 does not mean your AVM values are wrong. You are comparing your model values with sales which, individually, are all judgment calls. A prospective homebuyer bent on purchasing a pink house would overpay while a SFR Rental or an aggressive investor would buy a group paying below the market (some would be coded as arms-length), etc. Your model is essentially fixing those anomalies. Nonetheless, residual analysis and correction is an arduous but necessary optimization process. · 7. 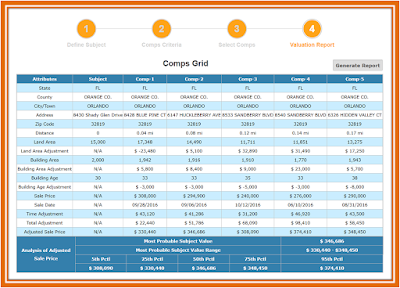 Independent Validation: Once the draft version is ready, comp a sample (where the Sales Ratios are either below 80 or above 120) at a self-directed comp-based valuation site. Set up the adjustment matrix there in line with your model coefficients. For example, if you are modeling a coastal town or county, your size adjustment factors will be significantly higher than their Midwest counterparts, etc. Similarly, adjust your time and valuation dates properly. If your model shows 12% appreciation in your model area and you are valuing for a future date, set them up accordingly; otherwise, you will be comparing apples to oranges. 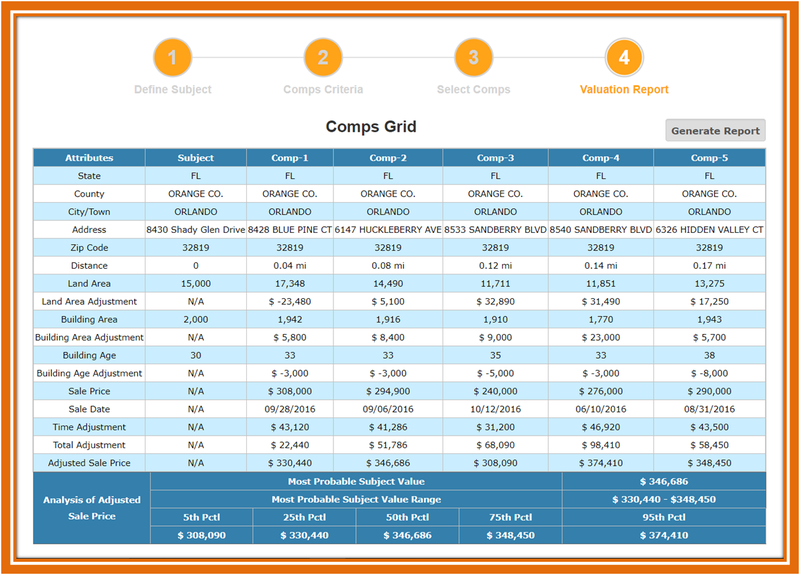 Your model values should be within 10-15% of the comps’. · 8. Hold-out Testing: Now that your draft is ready, test it on to the hold-out that you have kept aside. Once the model is applied, remove the outliers using the same range as in the modeling sample. The application results (Hold-out Sales Ratio stats – Percentile distribution, COD/COV, etc.) must be very similar to those from the primary model. If they are at variance, you must start investigating. Here is where the investigation starts: Make sure you are applying the final version from the 3rd cycle. · 9 Applying on to Population: Remember, the whole AVM exercise is to develop a model from the sold population (on average 4-6% homes sell annually) in order to value the mutually exclusive 95% unsold population. Of course, when you apply the model, apply it on to the universe (sold+unsold). Here is why: Since the sold population is the subset of the universe, the model values will be regenerated, forming a good basis for successful test application. The need for AVM is growing by leaps and bounds – banks, mortgage companies, servicers, REITs, Hedge funds, SFR Rentals, Large Tax Appeal houses, etc. 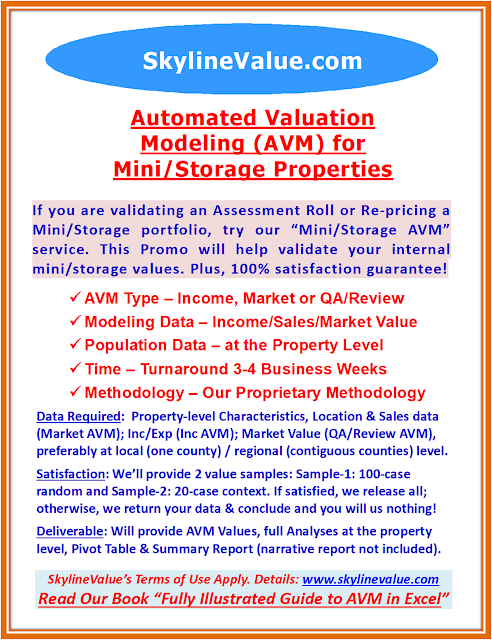 are all big users of certified AVM values.